Fennel is a perennial herb found in the Mediterranean that is commonly used as medicine to treat colic in babies. Though it hasn’t been proven with scientific research, the anecdotal evidence says that it helps to relax the colon to release trapped gas and decrease respiratory track secretions (source: WebMD). According to my new fav book, Natural Healing Wisdom and Know-How (where to buy), Fennel also helps to decrease obesity, water retention, urinary tract problems, indigestion, and colic and it even has hormonal properties that can increase a mother’s milk supply. Ginger, like peppermint, is more commonly used to treat indigestion because it contains chemicals that relieve nausea and inflammation (Source WebMD). Other uses include motion sickness, gas and diarrhea. I also use it in my homemade cough medicine and find it works very well. Dill is also used to treat water retention, obesity, and indigestion. Fun fact – Native Americans chewed on dill seeds to curb their appetites during long church services! (Also found in my new fav book). There are some chemicals in dill that are thought to relax muscles and increase urine like a water pill (source WebMD). 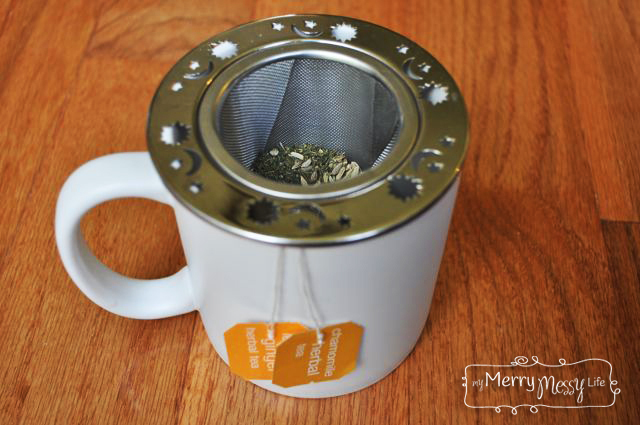 Chamomile is one of those herbs that can help with a multitude of ailments – from rashes to ulcers and menstrual pain, it also helps with indigestion, anxiety and insomnia – all of which are perfect for tiny people and their tummies. Essentially, gripe water is just herbal tea and there are two ways I thought of to make it. The super easy way and the super duper easy way. The first one is just to buy (I like Traditional Medicinals herbal teas) ginger (where to buy), fennel (where to buy), chamomile (chamomile), and/or peppermint (peppermint) teas. Put them all in a mug, pour hot water over it and steep for at least five minutes. Then add 1 teaspoon of organic, raw sugar. Let it cool and refrigerate to store. Fresh would be best, I suppose, but I’m a little too lazy and occupied with three under four to do that. So, I opted for loose, dried herbs and bags of tea (when I couldn’t find loose dry herbs) that I bought at the grocery store. I found Dill Weed (where to buy), Ginger (where to buy) and Fennel (where to buy) in the spice aisle, but it’s easier to find organic on Amazon. 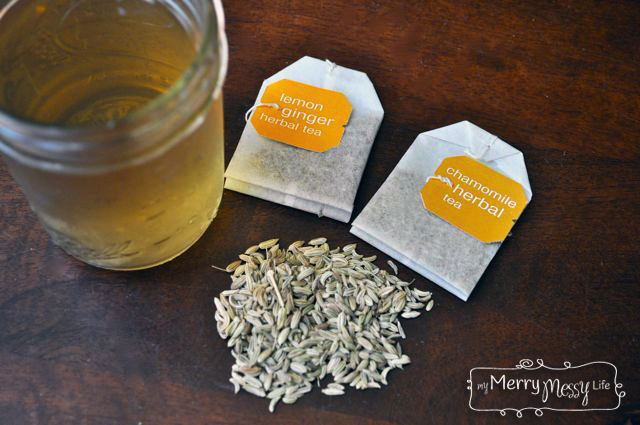 Then, I used bags of Lemon Ginger Tea (where to buy) and drank it a lot during pregnancy when I was nauseous) and Chamomile (where to buy) tea. 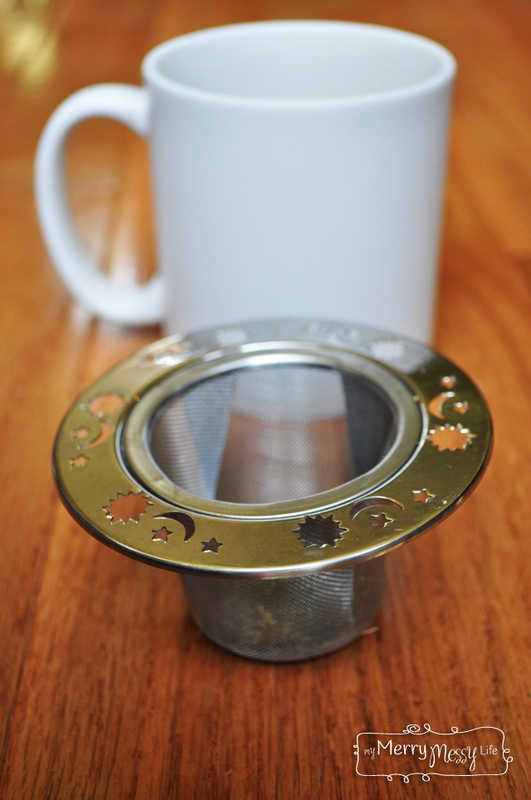 I put the tea bags in the mug and the loose herbs in the tea strainer (where to buy) and poured about 1 cup of hot water over all of it. Steep for about 10 minutes or just until it starts to get more strong (and also potent, which is good). If you find your’s is too strong and your baby doesn’t like it (cue really cute, squished up nose), then just add some water to dilute it. Then, LET IT COOL! It’s common sense, but ya know, we all forsake common sense in moments of exhaustion with a screaming baby. So, if you need it fast, maybe throw an ice cube in it. Add sweetener – You may find your baby will take it without sugar, but mine sure doesn’t like it. He does just fine when I add 1 tsp. of organic, raw cane sugar or coconut palm sugar. Refrigerate – to store and up to two weeks. HELPFUL TIP – I never use more than one cup of it in two weeks, so next time I make it I’ll put some in ice cube trays and freeze it. Then, thaw it under hot water when I need it. Essential oils! They work wonderfully to calm fussy babies and rowdy children. I’ve used it with a lot of success on my kids. Click here to buy the purest and most effective therapeutic grade oils I’ve ever used! 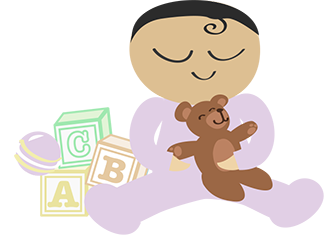 Read my post on how to use essential oils for babies here! 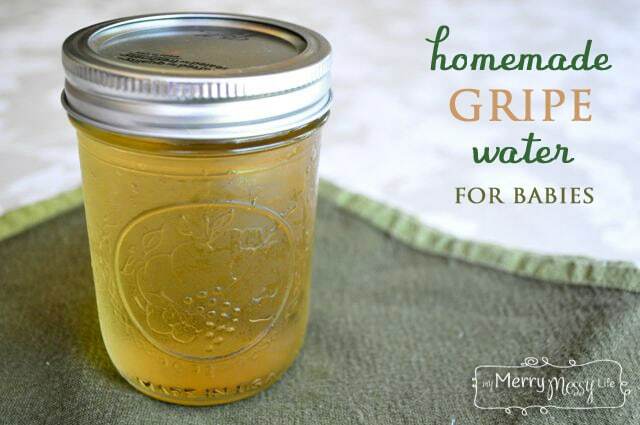 A recipe for traditional gripe water to ease stomach upset and colic in babies. Could help a person of any age, though! Pour hot water over all ingredients and steep for about 10 minutes, or until it starts to get strong. If you want to make more, add 2 or 3 cups of water and steep for 20 to 30 minutes. This entry was posted in Baby Stuff and tagged Gripe Water. Bookmark the permalink.